Beautiful farm with lake view, quiet, close to ski organizations. Property 4: Beautiful farm with lake view, quiet, close to ski organizations. Property 7: In the middle of the last Alpage in the center of Chatel, Pags Haut awaits you. "LE GRAND" 12 pax NEW !! Property 18: "LE GRAND" 12 pax NEW !! 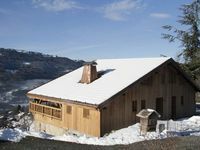 Property 25: Prestige rental near Megève with personalized services. Charm, relaxation. Host was always there to solve small issues. He made sure that the stay was really comfortable.